Cast iron pump with Big Bore cylinder and piston, combined with greater bore and stroke, delivers maximum performance. Substantially lower noise levels with a large 1,720 – RPM pump-enabling greater displacement at lower RPM. Reduces incidences of tripped breakers and voltage drop that can cause premature motor failure. Cooler running pump, minimizes wear. Specs: Horsepower: 2.0; Pump: Oil-lubricated; Tank (gal. ): 2.6 Hot Dog; Performance (CFM): 90 PSI: 3.3, 40 PSI: 3.8; Operating Pressure (PSI): 0 – 130; AMPS: 12.4; Noise level (dB): 80; Size: 18″x10″x22″; Net Weight (lbs. ): 52. Includes: 1/4″ Brass Makita universal coupler. Makita’s 2.0 HP Air Compressor is equipped with Makita’s Big Bore engineered pump cylinder and piston for higher output, less noise and improved job site performance. The MAC700 delivers industrial power and results with improved durability under tough job site conditions. Tank 2.6 “Hot Dog” gal. The MAC700 is powered by a 2.0 HP motor. The Makita Big Bore engineered pump with cast iron cylinder has greater bore and stroke for increased compression, faster recovery and less noise. The cast iron construction is engineered for increased durability even under tough job site conditions. The MAC700 has an oil-lubricated pump and is equipped with a large automotive style filter for increased air intake and greater efficiency. The Big Bore oil-lubricated pump is also more efficient: the MAC700 runs cooler and at half the RPM of most competitive units, resulting in greater motor and pump life and lower noise. The 2.6-gallon tank sustains an operating pressure of 130 PSI, and delivers 40PSI (3.8 CFM) and 90 PSI (3.3 CFM). The low AMP draw reduces instances of tripped breakers and voltage drop that can cause premature motor failure. The roll bar handle provides portability and additional protection, helping it withstand harsh jobsite environments. Additional features include a convenient oil drain and oil sight glass, a tank drain valve that supersedes standard petcock design for easier maintenance, and finned discharge tubing that dissipates heat more efficiently. The MAC700 is engineered for low noise, high output and less maintenance, and delivers industrial power and results with improved durability under tough job site conditions. The MAC700 is just another example of Makita’s commitment to innovative technology and best-in-class engineering. Every Makita tool is thoroughly inspected and tested before leaving the factory. If you are not satisfied with any Makita tool within 30 days of purchase, return it and Makita will provide a replacement or refund. Each Makita tool is warranted to be free of defects from workmanship and materials for the period of ONE YEAR from the date of original purchase. Should any trouble develop during this one-year period, return the COMPLETE tool, freight prepaid, to one of Makita’s Factory or Authorized Service Centers. Please see makitatools.com for complete details. 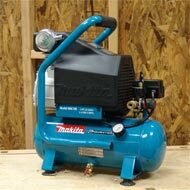 Makita MAC700 2.0 HP Air Compressor, oil and 1/4-inch universal quick coupler.